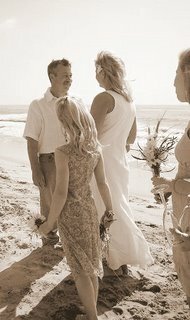 Over Memorial Day, my brother Tom married his darling Sue on the beach. 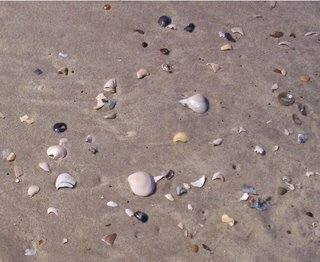 It was actually on the beach of Assateague Island, because - as the kids told us more times than you can imagine - there ARE NO BEACHES on Chincoteague. 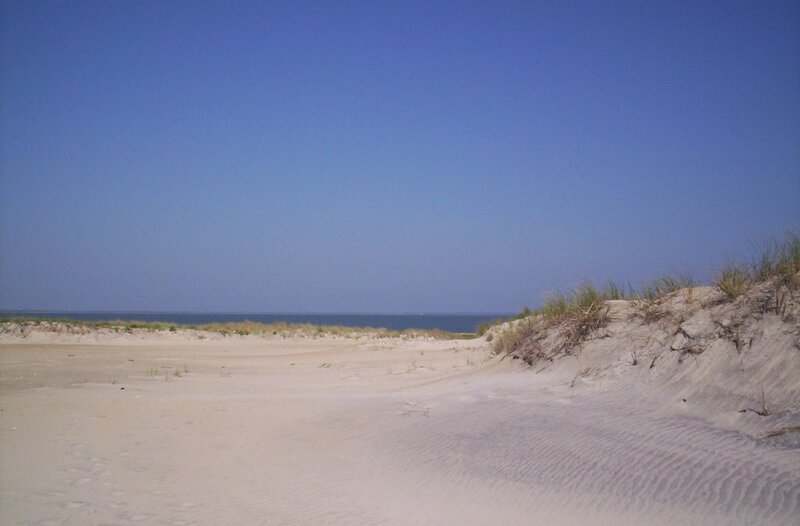 Chincoteague has salt marshes and bay shores, but no beaches with sand and waves. The wedding itself was beautiful and brief, leaving us with three days to fill. Holiday weekends require a three day stay at the hotels - so there we were. We had some great seafood and enjoyed some terrific shopping. Eventually we allowed the kids to leave for home a day early, and the whining finally ceased. Maryanne and I did get out on the beach one morning to look for shells to use in the resin crafting we've been thinking about. We were also going to try to find some nice seaweed for soap, but there was absolutely no seaweed to be found. We did find lots of gorgeous little shells. The water is really icy this time of year, so there was no need to try dipping the tootsies. The beach is always gorgeous and the wind that comes off the ocean is so mysterious to me. I always think about where that particul ar breeze last touched land... whose cheek it brushed, and all the things it passed to get to me. Wild Foods for Every Table nears completion!!! 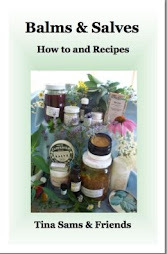 The wild foods book of recipes is coming along very well and should be completed soon. I'm working on making sure that the proper credit goes with each submission, and there are a few articles and recipes that must be typed in from the early days of the magazine --- back when it was assembled with lots and lots of tape. This has been a blast from the moment of inception. There was tons of stuff in the past issues, many submissions from the magazine Yahoo list, and the people that I contacted directly have been gracious and generous. As the deadline drew near, I started to worry about a cover. This is way bigger than the other books we've put together, and being a cookbook, it needs to lay flat - so that means coil binding. So.... it seemed like maybe a nice color cover would be in order. Gradually it started to come to me. I discussed it with my sister Maryanne, who is pretty handy with a camera. We tossed it back and forth while we planted rows of beans, peas, broccoli, patty pan squash, and melons next to the long row of peppers and tomatoes. She had some ideas to add, and by the time the garden was finished, we were ready. This is what we came up with. It really does suit the contents perfectly. The book will be going to the printer in early June, and will be finished within a couple of weeks with an expected ship date of June 19. It will retail for $8.95, and be available wholesale. You can pre-order now! 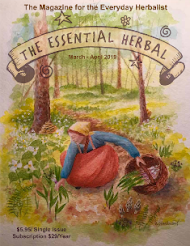 Here at The Essential Herbal, we are closing in on the deadlines for both the July/Aug issue of the magazine AND the latest book - Wild Foods for Every Table. This takes our attention elsewhere, and the blog has suffered. So.... with picnic season approaching, we have a wonderful article from last the May/June '05 issue. "Seating themselves on the greensward, they eat while the corks fly and there is talk, laughter and merriment, and perfect freedom, for the universe is their drawing room and the sun their lamp. Besides, they have appetite, Nature's special gift, which lends to such a meal a vivacity unknown indoors, however beautiful the surroundings." There’s nothing like the thrill of packing up a scrumptious meal in a picnic basket and gathering together your friends and family to enjoy an outdoor picnic on a bright and sunny summer day. One of my children’s favorite spots to picnic is at a small park along the intracoastal waterway near our home in south east Florida. We can enjoy the fresh ocean breeze and watch the comings and goings of a variety of boats, yachts and jet skis. We often see a variety of wildlife while enjoying our meal such as seagulls and pelicans. I’ve even been known to throw an indoor picnic for my kids on a cold and blustery day to help lift their spirits. I simply place a blanket on the floor of the living room and load it up with my kids favorite snacks such as cheese and crackers, fresh fruit, chips and lemonade. If you grow your own herbs you may pick them fresh from your garden to utilize in a variety of culinary creations including the recipes listed below. The produce section of most grocery stores stock a wide variety of fresh herbs during the spring and summer months. There is nothing to compare to the taste of fresh herbs. If you are unable to find fresh herbs you may use dry herbs in their place. The general guideline is to use 1/3 less of the dry herb than fresh. For instance if a recipe calls for 1 tablespoon of fresh herb you may substitute approximately 1 teaspoon of dried herb. In a small bowl add the herbs, green onions and cream cheese. Mix together until well blended. Cover the top of the bowl with aluminum foil and store in the refrigerator until ready to serve. Serve this delicious spread with an assortment of crackers and breadsticks. This dip is a wonderful accompaniment to fresh raw vegetables such as carrots, celery, broccoli, cauliflower and radishes. In a medium sized mixing bowl mix add all ingredients and mix well. Let chill for at least 2 hours in the refrigerator before using to allow all the flavors to meld together. Don’t substitute dried mint in this recipe. If you can’t find chocolate mint you can substitute peppermint or spearmint. Place the milk and chocolate chips into a medium sauce pan. Melt over low heat until the chips are melted and mixture is well blended. Remove from the heat and stir in the minced mint leaves, extract and walnuts. Pour into a 8 inch square pan, smooth the top with a spatula and chill in the refrigerator until ready to serve. Makes 16-20 servings. Use a food processor to shred the cabbage and carrots then add them to a large mixing bowl. In a small bowl mix together the remaining ingredients until all the sugar is dissolved to make the dressing. Pour the dressing over the shredded vegetables and mix together. Store the coleslaw in the refrigerator until ready to serve. Makes 4 cups of coleslaw. Cut the tomatoes in half, scoop out and discard the seeds. Place the hollowed out tomatoes on a platter. In a small bowl mix together the tuna, mayonnaise and dill. Fill the tomatoes with the tuna mixture. Place 2 tomato boats onto each plate which has been covered with a layer of 4 lettuce leaves. Sprinkle each serving with a little bit of salt and pepper if desired. Makes 4 servings. To make a hearty sandwich to serve at your picnic serve this egg salad on fresh slices of whole wheat herb bread. The recipe for whole wheat herb bread is included in this article. Place the eggs in a large pan, fill the pan with water and place it on the stove on high heat. When the water comes to a boil turn the heat down to medium and cook the eggs for an additional 12 minutes. Remove the pan from the stove, drain the water and run cold water over the eggs until they have cooled down. Remove the shells from the eggs and chop them up then place them in a large bowl. Add the remaining ingredients and mix well. Serve this salad with assorted breads and crackers if desired. Cook the pasta according to the package directions, drain, cover with cold water and drain again. Place the prepared pasta into a large bowl. Stir in the tomatoes, peppers, onions, olives, mushrooms, oil, vinegar, garlic chives and marjoram. Let chill in the refrigerator until ready to serve. Sprinkle with freshly grated parmesan cheese prior to serving if desired. Place all the ingredients into a large bowl and mix well. Chill in the refrigerator until ready to serve. This is another terrific sandwich spread to serve on top of the whole wheat herb bread. Drain the liquid from the can of chicken breast. Flake with a fork and add to a medium size bowl. Add the mayonnaise, celery hearts, sage and tarragon and mix well. Add salt and pepper if desired. This bread tastes great served along with the egg salad and chicken salad recipes which are also located in this chapter. Make this bread the day before your picnic. When making this bread choose from among basil, chervil, chives, garlic chives, parsley, thyme, oregano or marjoram or a combination of 2 of these herbs. Be sure to use the milder tasting soft stem herbs. Don’t use woody stemmed herbs such as rosemary or sage for this recipe as they may impart an overly strong flavor to your bread. Place the yeast in a small mixing bowl. Add the warm water and stir until the yeast has been dissolved. In a large mixing bowl stir together the flours, sugar and salt. Stir in the herbs. Stir in the yeast and water mixture and mix well. Add a little bit more warm water if necessary to make a sticky dough. Cover the top of the bowl with a small kitchen towel. Place the bowl in a warm place such as on top of the refrigerator and let the dough rise until doubled in bulk - approximately 1 hour. Sprinkle your hands with flour to prevent the dough from sticking to your hands then punch down the dough, divide it in half and place each half into a greased 9x5x3 inch loaf pan. Cover the pans with the kitchen towel and let the dough rise until doubled - approximately 30 minutes. Brush the top of each loaf with half of the melted butter and sprinkle with half of the celery seeds. Cook in a preheated 400 degree oven for 35 to 40 minutes until the loaves sound hollow when thumped on the bottom. Makes 2 loaves. In a large bowl cream the sugar into the softened butter using a large mixing spoon. Add the flour 3/4 cup at a time. Add the vanilla extract, pistachios and rosemary and mix until well blended. Roll the dough into large marble sized pieces using 1 level tablespoon of the dough and place on an ungreased cookie sheet. Bake in a 375 degree oven for 17 to 20 minutes until light brown. After the cookies have been removed from the oven and have cooled off slightly roll each one in confectioners sugar. This recipe makes approximately 30 cookies. Herb Fairs are a blast!!! We've been looking forward to the festival at Landis Valley for a few months. 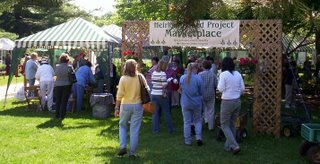 It was our first herb fest 15 years or so ago, and it was also the first herb festival we've done together since our "hiatus". This festival has never let us down, and this year was no exception. We went into it with zero expectations, and were absolutely thrilled. The first picture shows Kathy Musser of Cloverleaf Herb Farm. 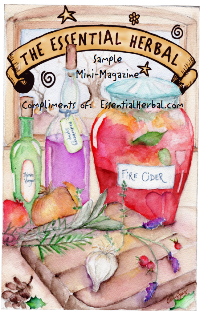 Her well kept greenhouse was photographed for the cover of the May/June issue of The Essential Herbal. The crowd started lining up way before the 9 am opening on each day, and the variety of herbs and heirloom plants was staggering. The gates opened and in poured thousands and thousands of herb enthusiasts - all in bright, sunny moods. It was wonderful to see so many old friends and customers. Generally, we work this way - I chat and jabber while Maryanne conducts business. That really isn't as bad as it sounds.... we came to the realization that we'd need to have some means of doing both. When working a show, you have "x" hours to do all the business you are going to be able to do. Having one of us do the chatting leaves the other to the business. It has always worked out very well for us. On Saturday, the skies opened (with a vengence!) shortly after opening. The rain came in buckets...oddly able to fall horizontally. Since we were in a very large tent with several other vendors, we just replaced the sides and continued. The rain forced many people inside (good for us! ), and other than the river flowing through our booth, all was fine. It left as quickly as it arrived, leaving behind a second gorgeous day. Our booth was lots of fun. We weren't sure how we'd incorporate all of the parts - the books and magazines, the soaps and toiletries, and the awesome, gorgeous torchwork jewelry.... but it all worked together very well. We put the "road apple" soaps in the front to start conversations. The felted soap balls attracted attention from "fiber folk", the "artzy-fartzy" soap got lots of attention , and the jewelry and magazines got the rest of them. All in all, it seemed to be a great mix. 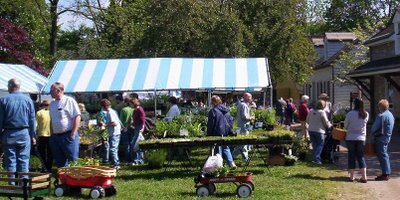 Now I can't wait for the next fair - the Garden Craft Faire at Alloway Creek Gardens & Herb Farm in Littlestown, near Gettysburg, PA. That one will take place June 2 and 3. 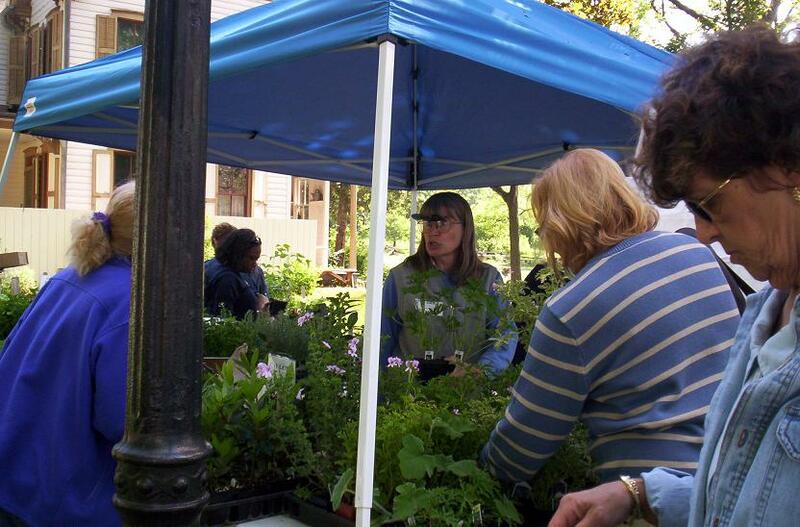 It features free garden talks and tours, artists, music, vendors, and tasty herbal food. 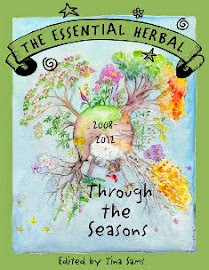 Two more days until my favorite herb faire - for either vending or buying! It's been a couple years since I set up there, although the same cannot be said for buying. Last year all of my patio herbs for cooking came from this festival. May 12 & 13Friday & Saturday, 9am-5pmGarden enthusiasts flock to our annual faire like bees to flowers. This is one of the largest East Coast plant and garden sales. Landis Valley's highly regarded Heirloom Seed Project, celebrating its 21st year, and more than 80 vendors tempt you with herbs, historic seeds and garden accoutrements. If you're coming, look for us in the big yellow tent to the right - very close to the heirloom plants. My sister will have her soaps and jewelry, and I'll be hawking the magazine and books. Be sure to say hello! There will be pictures later :-). 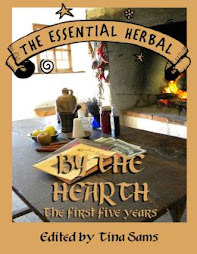 We 're putting together one of our Essential Herbal books, and this one will contain recipes and favorite ways to eat wild foods. Contributing is easy and will provide lots of publicity if you have a business. 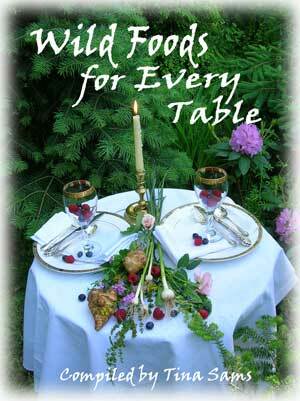 Do you enjoy nibbling on chickweed, garlic mustard, dandelion, day lilies, and wild mustard? Perhaps you have been putting those acorns to work? Lamb's Quarters, Sheep Sorrel, Sweet Violet and Rose Petals find their way into your salad bowl? When you see burdock and poke in the fall, does it cause you to make a mental note of the location? If so, please consider sending a recipe or two in for inclusion. Pictures to accompany the recipe are welcome as well. The deadline for this book will be May 21. Be sure to include your contact information as you'd like it to appear next to the recipe(s). That would be either a website, or if none available, hometown. Email would be appropriate if you wish, too. In a large saucepan heat oil over medium high heat. Add onions; cover and cook 2 minutes. Add carrots, celery, water, tomat oes, bouillon, basil, thyme & garlic, cover and heat to boiling. Uncover and simmer 10 minutes. Stir in beans and broccoli and simmer 5 minutes more. Per serving: 100 calories; 5 grams protein; 17 grams carbohydrate; 1 gram fat; 320 milligrams sodium. In a large saucepan, heat oil over medium heat. Stir in garlic, fennel and red pepper flakes; cook 1 minute. Add tomatoes, clam juice and wine; bring to a boil then cover and simmer 5 minutes. Increase heat to high. Add cod; cover and cook 3 minutes. Add shrimp and mussels; cover and cook 2 minutes more or until mussels open. Per serving: 223 calories; 30 grams protein; 8 grams carbohydrate; 7 grams fat; 260 milligrams sodium. These are both delicious. Some of the other recipes - like a tarragon mustard chicken dish - have become staples.